The hottest topic of the year GST (Goods and Service Tax) is on everyone’s mind. Several industries are said to have a positive or negative impact due to GST rollout since July 1. EY (Ernst & Young) earlier reported that about the implications of GST in several sectors which included FMCG, Auto, Real Estate, Government, Advertising, Power and so on. 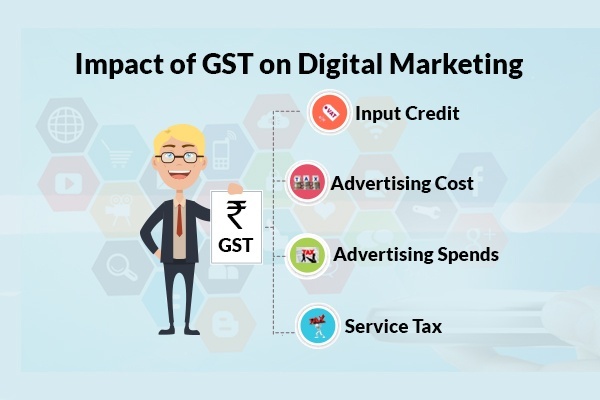 While each GST is set to affect each and every sector, differently let’s take a deep dive into understanding the impact of GST on the digital marketing industry. GST is a prominent change in the Indian economy and will play a crucial role in improving transparency, reliability and timeline of the mechanisms. Earlier, advertising spend was considered as the manufacturing expense and was charged as Sales Tax and VAT. Hence, there was no input credit available and advertisers and marketers incurred huge losses. However, now with the GST implementation, expenses incurred on advertising will be available for input credit 18% on advertisement tax. This will help cut down the losses of advertisers. GST is basically a tax only on value addition at every stage. Hence, a combined GST chargeable through supply chain will greatly ease the impact of tax by reducing the cost of creating an ad. As the advertising costs decrease, the advertising spends are expected to rise. It is reported that the companies will gain from the lower cost of creating an ad creative and so it will further invest the savings into advertising again. This will further increase the ad spend by 10% in 2017 – 2018. The service tax now is 18% i.e. 3% higher than the earlier tax provisions. However, though some may find it troublesome, the reality is with input credit available, the 3% rise will not have any significant impact on advertising spend. Ensure taking a note of equalisation levy which is directed towards foreign multinational digital giants such as Google, Facebook, Twitter, etc. The equalisation levy is charged on digital services such as web hosting, online payments, creating ads, blogs, websites, emails, radio and T.V. advertising. It further includes online sales of goods and services like movie, songs, books, software, games, etc. Social media marketing platforms like Facebook has already made it necessary to update the business’ page and ad account with GST registration number. However, costs of Facebook Ads will not charge GST as compared to other social media platforms. While the impact of GST is positive, neutral or negative across all industries, the digital industry particularly, is set to generate good revenue through advertising.